In Pride and Prejudice Fitzwilliam Darcy begins his relationship with Elizabeth Bennet with the words: "She is tolerable, but not handsome enough to tempt me; I am in no humour at present togive consequence to young ladies who are slighted by other men." What would have happened if Mr. Darcy had never spoken so disdainfully? First Impressions explores how the events of Jane Austen's beloved novel would have transpired if Darcy and Elizabeth had danced together at the Meryton Assembly. Jane and Bingley's relationship blossoms unimpeded, Mary makes a most fortunate match, and Lydia never sets a foot in Brighton. 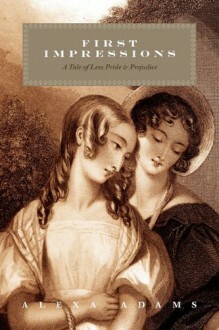 Austen's witty style is authentically invoked in this playful romp from Longbourn to Pemberley.